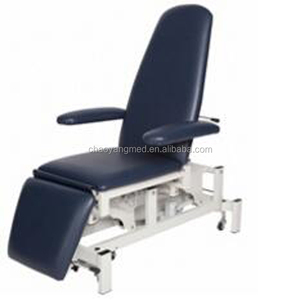 phlebotomy chairs for sale it offers soft, radius lines for a more &ldquo;at-home feeling&rdquo; that fits flawlessly in a patient room setting. The Trendelenburg feature comes standard and is unmatched in efficiency and ease of operation. 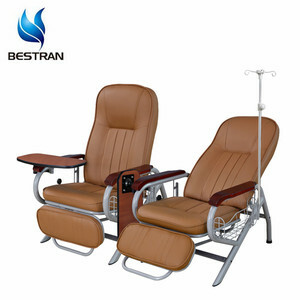 The Passage is ideal for use in oncology, surgery centers, dialysis, infusion therapies, patient rooms, long-term care environments, at-home infusion SPECIFICATION weight capacity 300 lbs. We have strong R & D team, expert in new products develop, perfect the mature products. We can design the products according to customer needs. Leg section and back section moved together. :21.5KG The frame and leg all made of heavy duty metal square pipe with protective. The top made of High-density stretchy sponge and Artificial Leather. The fabric is pressed PVC artificial leather. IV: Training & Warranty service We provide customers free product training in our factory. IIV: Extend Service We provide the product spare parts for ten years. is a specialized supplier of Medical and Health Care Products, adhering to the principle of "Professional takes you to satisfaction". 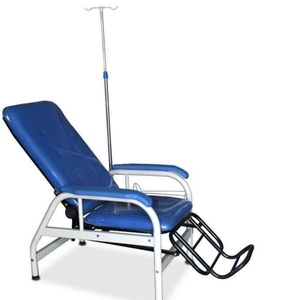 High Quality Adjustable Reclining Hospital Infusion Chair 1.Chair frames are made of high quality stainless steel tube and meet the international standard , fine-looking and durable; 2.Chair surface using PVC, high quality sponge and laminated panel of high density , beautiful and 3.Infusion rod is equipped as standard configure. Specifications Product Name Infusion Chair Model Number RP-002B-2266 Dimension L1990*W640*H1800mm Packing One set per carton Material Frame High quality stainless steel Chair Surface high quality sponge covered PVC over laminated panel of high density Function Chair Back & Foot Rest Adjustable Safety Certificate CE, ISO13486 & ISO9001 Guarantee One year Accessories Standard equipped 1 pair of wooden arm rest; 1* IV support Trade Show Certificate Our advantage Packaging & Shipping Standard export packing or as client's requirement and prompt delivery time We can do best&beyond. Contact If you have any problem or the requires about the products ,pls feel free to contcat me, we are pleased to offer you the best products you need . 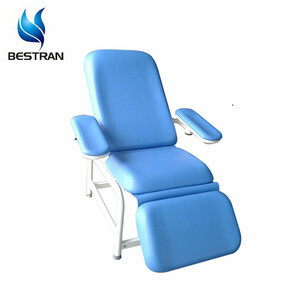 China BT-DN008 Manual Blood collection chair phlebotomy couch blood donor couch for sale BT-DN008 Description: Back,leg,seat sections are manual Arm board move and swing operated by manual SPECIFICATION Chair Dimension: 1650mm(Curve Length) * 560mm Back section lift: 0 ~ 70&deg; Leg section turn: 0 ~ -60&deg; (leg section and back section work as one unite) Arm Board swing out: 0 ~ 45&deg; Arm board slide: 100mm Arm board dimension: 450 * 160mm Arm board Concave Radian: R108 Competitive Advantage: 1. We produce most bed parts ourselves to control quality at every procedure 2. Advanced bed part molding machines, advanced welding technology and advanced anti-rust treatment techniques. 3. Perfect treatment on bed details 4. Suitable package to ensure goods safety and save container space 5. Fast and on-time delivery 6. High-efficient After-sales service 7. Powerful OEM capacity 8. More than 10 years&rsquo; manufacturing experience Product photo: Color for your choice: Q: 1. What is the lead time9 A: Normally 25 days Q: 2. What kind of motors equipped9 A: Linak Q: 3. Can you put our logo on beds9 A: Yes, please provide the finished design of your logo, we will make it into stickers. Q: 5 Do you accept OEM service A: Yes, OEM service available, please provide your drawing and detailed specification. 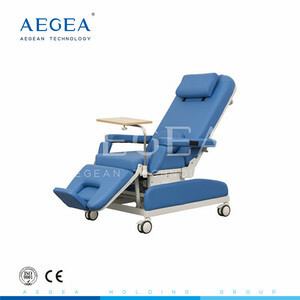 The integral elevating function of the chairs can increase or decrease the pressure of blood collection. The back linkage structure can regulate various positions of the blood donor. The left and right handles can be regulated in all directions according to the requirement of the blood donor. 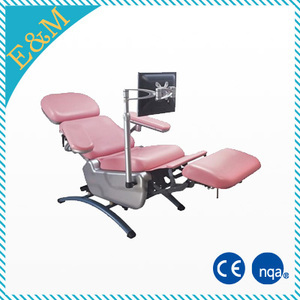 Alibaba.com offers 455 phlebotomy chairs for sale products. About 64% of these are hospital chairs, 3% are physical therapy equipments, and 1% are pedicure chair. 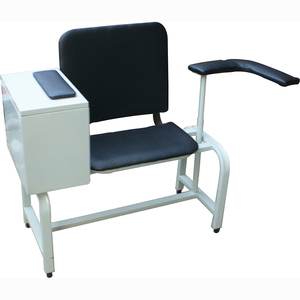 A wide variety of phlebotomy chairs for sale options are available to you, such as metal, synthetic leather. You can also choose from no, yes. 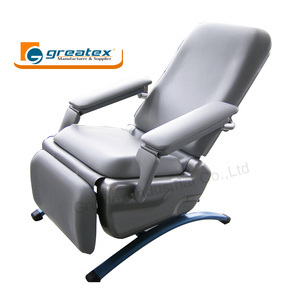 There are 375 phlebotomy chairs for sale suppliers, mainly located in Asia. 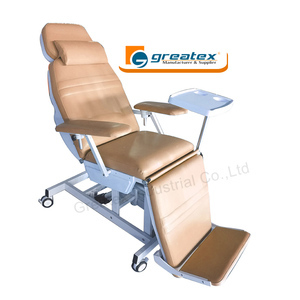 The top supplying countries are China (Mainland), India, and Turkey, which supply 97%, 1%, and 1% of phlebotomy chairs for sale respectively. 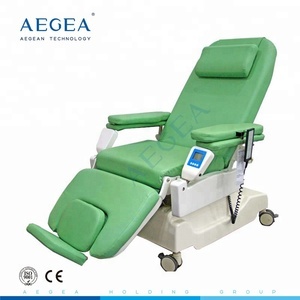 Phlebotomy chairs for sale products are most popular in South America, Africa, and Southeast Asia. You can ensure product safety by selecting from certified suppliers, including 153 with ISO9001, 98 with ISO13485, and 46 with Other certification.